In this article, we will take a closer look at AngularJS Controllers. We will use AngularJS controllers to build the model for our Project Tracking website. Initially we will build the models for our project with some static data and later we will replace them with calls to HTTP Services. We will also look at how to design Views to perform different operations as per the user's requests. In an Angular JS application, everything starts with the Controller. The Controller communicates with the model and bundles up what is needed for the view. So the controller is responsible to build the ViewModel. You can create multiple controllers for your application. Controller also provides command methods that can be called from the view on certain events. The bootstrapping of the application can be specified by module declaratively and hence they are easy to understand. Modules help in keeping the code cleaner. We can achieve better separation of concerns by creating a module for every domain aspect of the application. Modules can be loaded in any order or even parallel because they delay execution. Testing is easier and faster as you need to load only those modules which are needed. A controller is just a function which will be invoked by AngularJS in HTML. We can make use of the above declared controller into our HTML page using an Angular directive ng-controller. We can provide a name to our controller to identify each controller uniquely. We will be creating multiple controllers for our website. 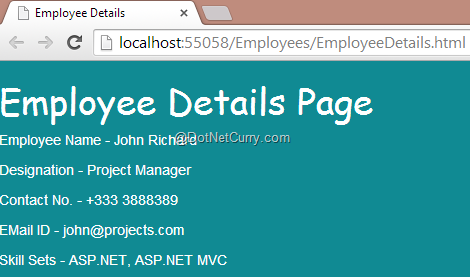 AngularJS will read the ng-app directive from the HTML page and bootstrap the Angular module. Then it will look for other directives/expressions. In our case, AngularJS will read the ng-controller directive. AngularJS controller takes the $scope parameter. $ is a special sign used for convention in AngularJS. Anything that starts with $ is a component of AngularJS which comes out-of-box. In HomeController, we have passed the $scope parameter. We attach the models to $scope. Angular now will look for CompanyName associated with $scope object. Include the HomeControllers.js file reference into our Home.html. In the above HTML code, we have initialized Angular with ng-app directive which refers to our module “ProjectTrackingModule”. 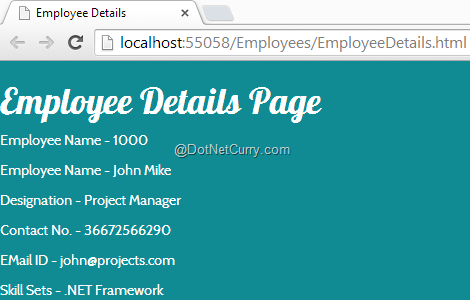 We have added EmployeesController with the help of ng-controller directive into our <body> tag. Then we have used the employees object which is associated with $scope object of Angular with the help of binding expression. Here’s the output of the above HTML code. So far, the data which we used in this demo is static. We will try fetching the data from the database which we created in the first part of this series. For this, we will be fetching the HTTP services which we defined in article Building Services using ASP.NET Web APIs. To fetch the HTTP services into AngularJS Controller, we will have to inject the $http service into our controller. As mentioned before, $ sign refers to AngularJS components and services. $http is a built-in service in AngularJS which helps in calling HTTP services. It provides HTTP methods like – GET, POST, PUT and DELETE to perform CRUD operations against the service loaded on some web server. Let’s change the code in our EmployeesController. In the above code, we are using get() method of the $http service. This method does not return the data immediately because it performs the operation asynchronously. The get() method returns a promise. A promise is an object which gives the access to the result of the asynchronous task, when it completes. The code consuming a promise can then use the result or handle the errors based on pass or fail case of the promise respectively. We can make use of the then method to fetch the response from the get() method. In our above code, we have created two functions. The first function employees assigns data of the result to Employees array. Also if something goes wrong, we can call the errorDetails() function to track the errors or log the error. In the above code, when the call is successful, we are calling the employee() function and when the call is unsuccessful, we are calling the errorDetails() function. Now we will add ProjectsController.js into our Controllers folder. That’s it for this article. In Part IV of this series, we will look at Directives. While designing Views, we will make use of different directives which are available out-of-box in Angular JS.